NOAA archaeologists have discovered the battered hulls of two 1800s whaling ships nearly 144 years after they and 31 others sank off the Arctic coast of Alaska. 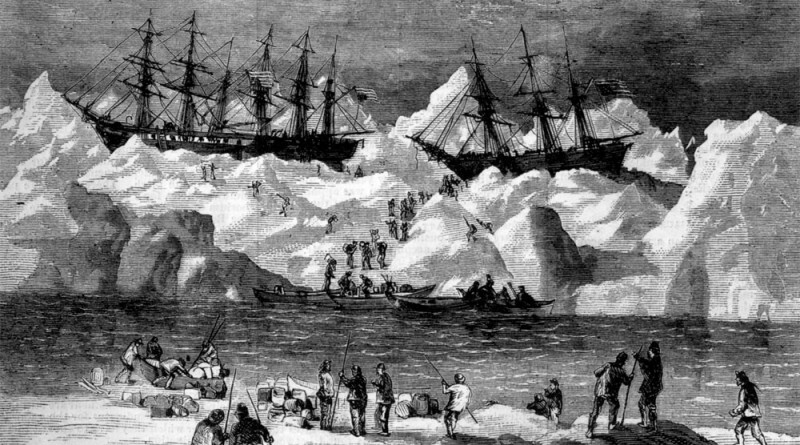 The shipwrecks and parts of other ships found are most likely the remains of 33 ships trapped by packed ice close to the Alaskan Arctic shore in September 1871. The whaling captains had counted on a wind shift from the east to drive the ice out to sea as it had always done in years past. The ships were destroyed in a matter of weeks, leaving more than 1,200 whalers stranded until they could be rescued by seven ships of the fleet standing by about 80 miles to the south in open water off Icy Cape. No one died in the incident but it is cited as one of the major causes of the demise of commercial whaling in the United States. With less ice in the Arctic as a result of climate change, archaeologists now have more access to potential shipwreck sites than ever before. In September, a team of archaeologists from the Maritime Heritage Program in NOAA’s Office of National Marine Sanctuaries scoured a 30-mile stretch of coastline in the nearshore waters of the Chukchi Sea, near Wainwright, Alaska. Previous searches for the ships had found traces of gear salvaged from the wrecks by the local Inupiat people, as well as scattered timbers stranded high on the isolated beaches that stretch from Wainwright to Point Franklin. Using state-of-the-art sonar and sensing technology, the NOAA team was able to plot the “magnetic signature” of the two wrecks, including the outline of their flattened hulls. The wreck site also revealed anchors, fasteners, ballast and brick-lined pots used to render whale blubber into oil. James Delgado, maritime heritage director for NOAA’s Office of National Marine Sanctuaries, said he believes the wrecks were pressed against a submerged sand bar that rests about 100 yards from shore.